I read the news today, oh boy (and yesterday and in these depression months), and the suicide story’s unrelenting: Linkous, Jay R., Jamie, Hughes, Hendry, Andrew, the Cornell Kids…. When the good people come (and they will) with their helicopter to lift you out, please (I beg of you) choose to let these people in. We beg of you…let them in. “With the door closed, shades drawn, the world shrinks. Let’s open up those blinds. But someone has to sweep the floor, pick up her dirty clothes. Now that everyone’s an enemy, my heart sinks. Let’s put away those claws. I don’t blame them for their curtains-calls because I pulled the rope. I wannna call them back out for applause. Spring and Thompson on the first of May is horrible. while I hope that she won’t come home. Well you can come inside, unlock the door, take off your shoes. But this might take all night. I put its rope around my neck. you knew just what to expect. That with the door closed, shades drawn, we’re dead enough. They don’t open from outside. to never let that right be denied. but I just don’t know where to begin. I wanna bust down the door, if you’re willing to forgive. I’ve got the keys. I’m letting people in. don’t bargain when you’re weak, don’t take that sharp abuse. Some patients can’t be saved, but that burden’s not on you. Our library is a luminous treasure trove, and is perhaps my favorite habitat in our fine town. While meandering through the stacks looking for how-to-draw books, I discovered illustrator/author Edward Gorey and two of his books: The Broken Spoke (1976) and Amphigorey (1972). The books are filled with beguiling and bizarre drawings and comics (alternatingly whimsical and tenebrous), all obviously drawn under the influence of a keen mind and/or the prevalent psychedelics of that era. 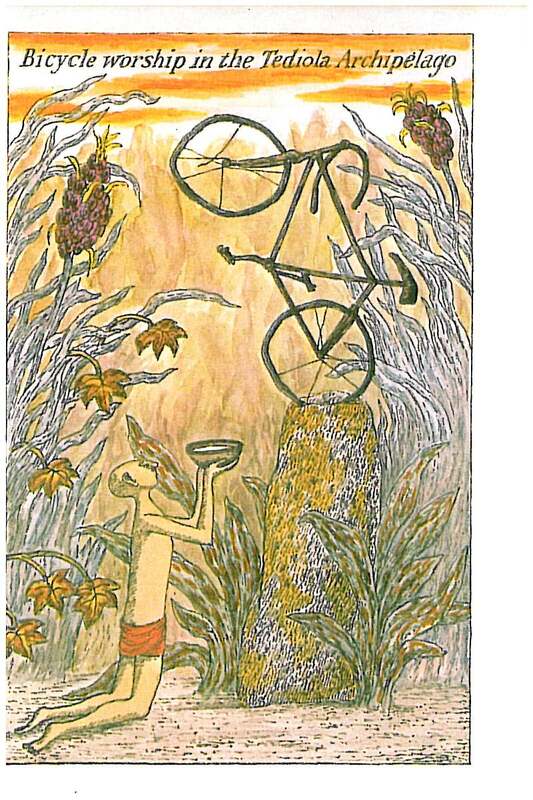 The Broken Spoke is an homage to all things cycle-delic. And given my addiction to all things cycling, The Broken Spoke immediately spoke to me. 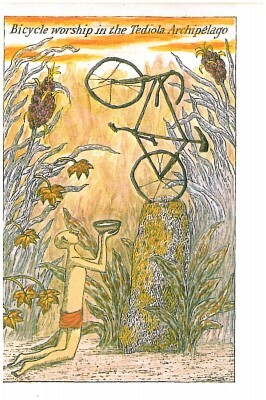 Gorey’s drawing entitled Bicycle Worship in the Tediola Archipelago is typical of Gorey’s Two Wheels Good collection. We recently checked out the splendiferous Edward Sharpe and the Magnetic Zeros and had the fortune of catching the opening band, Chief. Jeffrey of Club Mercy let us know that Alex (Sharpe) was touting the band so we made sure to catch their set. While Chief isn’t breaking any musical ground (yet), they play with verve on well-crafted songs graced with compelling lyrics and hammering (3 or 4-part) harmonies. After their set, hirsute guitarist, Danny Fujikawa, mentioned their impending new longplayer, but his face lit up when I said I’d prefer to hear their “less-polished” EP. Next thing I know, Danny slips out to their van and brings me their stellar five-song EP. At times they remind of the Band and at others I hear Bruce Cockburn vocals. Regardless a band to keep track of. 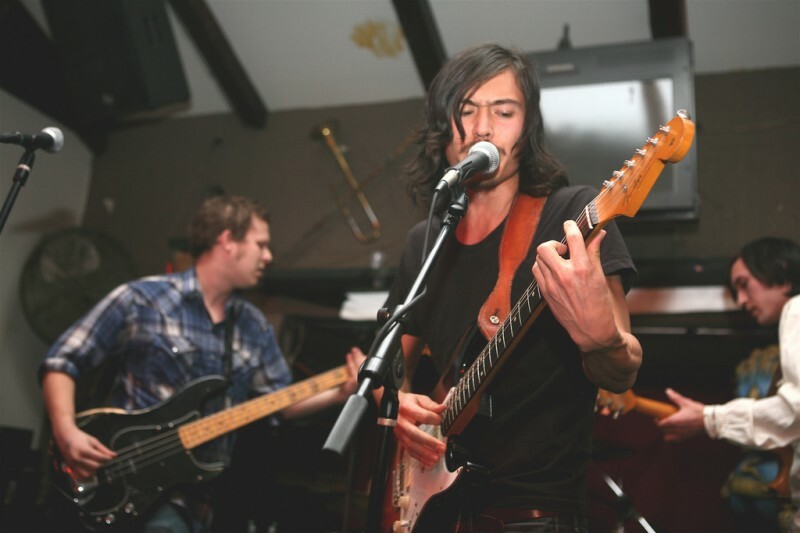 Check out their song Nice People below and the video of Your Direction at the Deep Six Club TV link further below. Comments Off on Testing 1 2 3 Testing…..